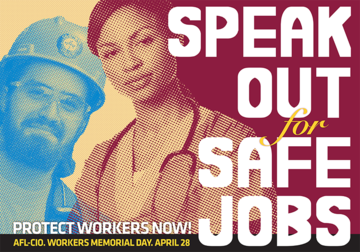 On April 28 we observe Workers Memorial Day to remember those who have suffered and died on the job and to renew the fight for safe workplaces. We will be doing community outreach and tabling in the downtown area of Syracuse to share information about job safety hazards and how to exercise job safety rights. Join us to speak out for safe jobs! 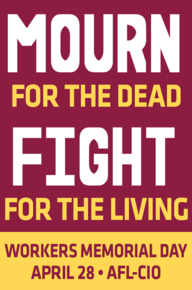 Stop by Plymouth Church (232 E. Onondaga St. Syracuse, NY 13202) between the hours of 10AM-1:00PM on Tuesday, April 28th to take part during our Workers’ Memorial Day Action.